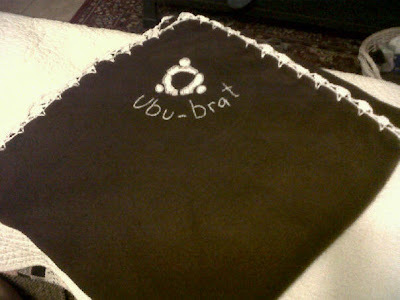 I just finished up a blanket for some friends in the Ubuntu Community who are expecting a baby soon. I used Brown fleece and white thread. (adopting the new color theme). I crocheted the edging all the way around. (It's one and a half yards long). I was trying for the "kids drawing/crayon" effect with the logo and lettering. I don't think it's too bad for my 1st attempt.